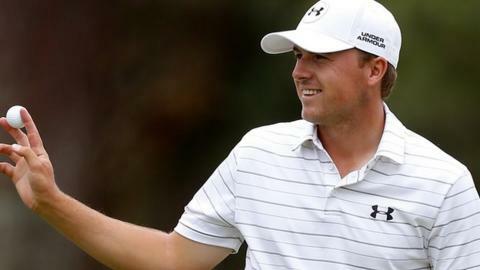 Masters champion Jordan Spieth shot a nine-under-par 62 in the second round of the RBC Heritage - only to be outdone by fellow American Troy Merritt's course record-equalling 61. Spieth, 21, struggled to a three-over-par first round but a bogey-free day two moved him to six under at halfway. He is six shots behind Merritt, who leads by four from two more Americans, Matt Kuchar and John Merrick. Northern Ireland's Graeme McDowell carded 70 to be in a tie for fourth. McDowell - who last won on the PGA Tour in this tournament in 2013 - co-led overnight in South Carolina but is now joined by Americans Jim Furyk and Kevin Kisner on seven under. The former US Open champion said he thought "wow" when he saw Spieth's mark of 62, adding: "When you're on, you're on." Spieth, whose first-day struggles had left him at risk of missing a first cut in eight events, had nine birdies, chipping in on his penultimate hole and birdying the last after firing an iron to within four feet of the flag. "That was just better golf," said Spieth, who has two wins and two runner-up finishes from his last four starts. "I told you guys yesterday, no excuses. I just played poorly." "I went back to posture, ball position, hand position and tempo. And I struck that ball quite a bit better." Merritt, 29, has never won on the PGA Tour but managed 10 birdies - seven of them on the back nine - to match David Frost's course record at Harbour Town set in 1994. England's Ian Poulter and Luke Donald both finished inside the cut line on three under, level with Russell Knox, with his fellow Scot Martin Laird also making the weekend on level par.